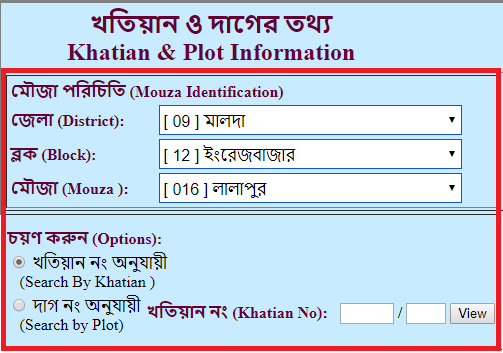 Know your Banglarbhumi Khatian No and Plot Information by using Khatian Number wise & Plot Number wise at banglarbhumi.gov.in website Citizen Service Tab…. West Bengal is one of the biggest state and highest populated state of India. Apart from this the state is also the leader in land reforms in the country. West Bengal has more than 15 lakh Bargadars / Share Croppers which is not the case in any other state of India. The state has also distributed homestead land to more than 5.6 lakh beneficiaries. Thus, overall the state has close to 30 lakh patta holders in the state. This signifies the need to significance of an organized system for land records in the state, this is what has been done with respect to the documentation of records for both the parties. For the benefit of land records, most of the information has been compiled on a web page of Banglarbhumi by the land and reforms department of West Bengal. For Government: Proper record keeping of the land helps the government keep a check on any fraudulent transactions going in the state. It helps in an ease in retrieval of any document required for any validation or audit purpose. Thus saving a lot of man power and time. For Buyers and Sellers: People can check the authenticity if any land on the website. This can save peopled from getting tricked, they can check the value of the land, and information regarding the owners’ etc. people can also download various property relevant papers like Record of rights etc. One can also compare the land prices at various places which can help them make a buying decision. The same information can also be accessed using an app, thus helping buyer people to check land related information over the mobile on the go. The overall structural change and development is helping people by giving a lot of control as well as savings in term of money as people don’t have to visit land department. Apart from the other important information that a person can select, one is Banglarbhumi Khatian No & Plot information. This will open the home page of the website: home page would have multiple menu options given at the top of the website. One needs to click on the “Citizen Service” which is the 3rd option from the left. Another page will open with the title “Khatian and Plot information”. 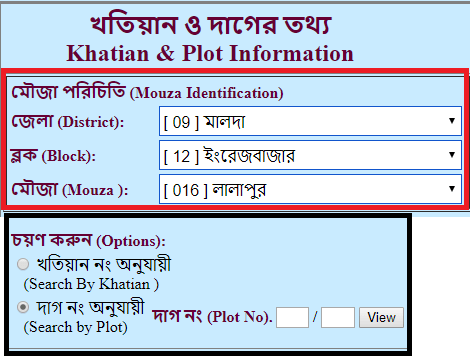 On this page one can select the District name, Block name and Mouza name from the drop down. One need to select the right options to get the right result out. After this the user need to enter the West Bengal Banglarbhumi Khatian number or the Banglarbhumi Plot Number, user can enter either of these as per their preference. After entering all these details, user needs to click on enter and all the relevant information will be displayed. While “Black” color means that no data is available. If Banglarbhumi Khatian no./ Plot no. is in the form of ‘99999/99’ then put the first portion i.e. ‘99999’ of that in the box before the slash and put the second thing ‘99’ in the box after the slash. e.g. ‘495/1’ then put 495 before in the first box before the slash and the second information in the other box after the slash. In case the information is provided in the form in the below format as ‘99999’, thus the information Khatian no./plot no. does not contain a back slash, in such cases whole information needs to be put before the back slash ‘/’, e.g. if ‘49501’ is the number then the number 49501 should be put in the first box before the back slash. In case it displays “No records found”, this means the record is either not available or there is an invalid entry. This side is not view of citizen option .